Technology is changing at an extremely fast pace, and there are a number of common IT problems that small business owners face as a result. With an established network of computer technicians available to assist and support you with all your computer needs, Tribus Computer provides meaningful and effective managed IT services in Toronto and the surrounding area. Contact Tribus Computer today to see how we can help you. No matter the size of your business, security is something you need to be concerned about. Every company is at risk of being hacked or having their data leaked. In fact, often small businesses are at greater risk because they haven’t taken proper security measures. According to Inc.com, about half of all cyber attacks target small businesses. On top of that, approximately 60% of small businesses go out of business within six months of a cyber hack. 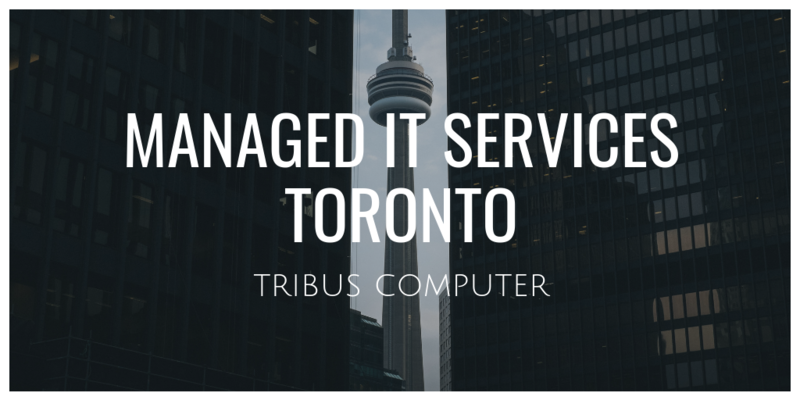 Stay ahead of the game and get your managed IT services in Toronto from Tribus Computer so that network and data security doesn’t become your concern. Securing your network is a top priority. Data backup is something that your business should not only plan for but also be regularly implementing. Unfortunately, data backup is something that many small to medium-sized business still are not doing. Along with security, data backup is a major problem for small businesses. You need a good backup plan to ensure your data is secure. A 2015 Verizon report noted that data breaches with less than 100 lost files can cost a business between $18,000 – $35,000. Data backup is not something to gamble with – you want to be sure you are prepared for system failure, natural disasters, and even human errors that can result in data loss. Data backup is something that your business should plan for and also be regularly implementing. Cloud services are something you should be interested in. There is a lot of confusion around “the cloud,” but simply put, cloud computing means storing and accessing data and programs over the Internet instead of your computer’s hard drive. The cloud is just a metaphor for the Internet. The cloud is everywhere. Along with data storage and backup, a cloud backup and cloud service is something every business, no matter what size, should consider. Cloud services are a great way to invest in the IT needs of your business without having to build infrastructure to support it. Do you look around your office and see paper everywhere? Paper is slowing business operations down. How long does it take you to retrieve a file from a filing cabinet? Do you want employees wasting time looking for information? According to an often-cited PricewaterhouseCoopers study, 7.5% of all documents are lost and another 3.5% are misfiled. Over the course of a year, 1 out of 10 paper documents will go missing and need to be recreated (and those missing documents can be a compliance issue as well). Document management and capture tools can digitize your documents and store them in one easy-to-access and secure hard drive. Instead of wasting that time looking for a file, now you can find the digital information you need in seconds. Digitize your documents and store them in one easy-to-access and secure hard drive. Far too often, companies don’t take time to plan an IT strategy. Businesses often miss the fact that proper use of technology can multiply your time and resources, saving you money and making your company more productive. You need to work with someone who can help you identify the IT services you need that will support your business today and help you plan for the future. Tribus Computer can do that. A strong IT plan is essential for your business. Trust Tribus Computer For Managed IT Services, Toronto! At Tribus Computer, we have an established network of computer technicians available to assist you in your “end to end” computer needs. From design to purchase to installation and support, Tribus can let you “get back to business” while looking after your back office for you.